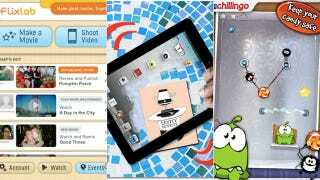 In this week's app roundup: Cut the Rope, finally on Android; videos, edited with different sources; coding, done on the iPad; grills, made; calls, filtered; cars, unlocked; Wacom, iPadified; and much, much more. Cut the Rope: An iOS game mainstay, it's finally available on Android. And it's Free at GetJar! The premise of the game, if you've been living under a rock, is to feed Om Nom his candy by cutting ropes in strategic fashion and also gathering as many stars as you can. Trust me, it's not as boring as it sounds. You'll be addicted in no time. Free.